About this time of year in North America, a fascinating phenomenon occurs: monarch butterflies commence their migrations. Those west of the Rocky Mountains head over to the California area. Monarchs in South America have a migration as well, but those are not understood very well. Some of these insects stay put. The most interesting are the monarchs east of the Rockies, who head down Mexico way. Amazing how the Master Engineer equipped insects with such tiny brains to navigate huge distances. It's startling enough that Pacific salmon return to the places of their births, but monarchs go to areas they've never been before! Several critters make long journeys, and have various methods of navigation. 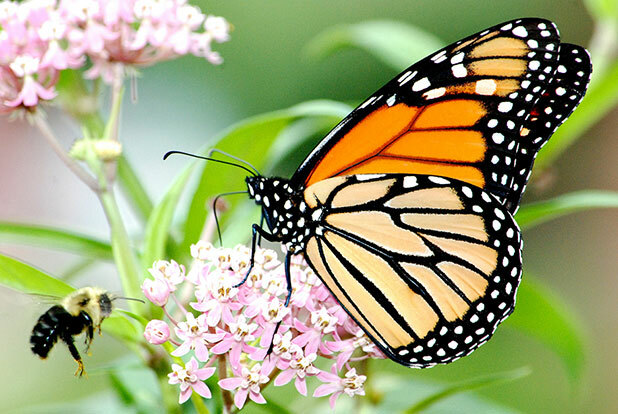 Both migration, and the life cycle of monarchs, defy evolutionary thinking. I don't know how it's done, but volunteers help track monarchs, especially since their habitats are dwindling and efforts are being undertaken to save them. If you study on it, monarchs are quite amazing in many ways, including their migration. To read the rest, flutter on over to "The magnificent migrating monarch".